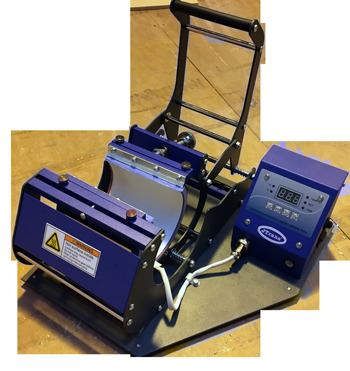 The JTrans Multi Mug press has been produced specifically for transfer print decoration of mugs and drinkware. This simple, robust machine, is powered by a microprocessor for control of both heat and dwell accuracy and ease of operation requiring minimal operating space. Our 6-in-1 mug press means you no longer have to worry about buying separate heating elements or mug presses in order to press all of the different types of drinkware available! Save time AND money while creating beautiful, quality products in your own home and business. This press includes heating elements for 11 oz and 15 oz mugs, steins, large and small latte mugs and water bottles. Mug making has never been easier! Our digital control unit features easy to read and use controls, allowing you to set the time and temperature with the simple touch of a button.